Strontium is a trace mineral which concentrates in the skeletal system, where it supports the function of osteoblasts (the cells which form new bone) while reducing the differentiation and activity of osteoclasts (the cells which resorb old bone). 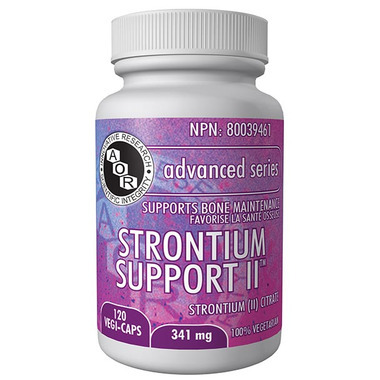 Strontium Support II by AOR helps maintain bones. Adult Dosage: Take 1 or 2 capsules daily on an empty stomach, at least two hours before or after food, calcium or milk since these can significantly reduce strontium absorption if taken together. Ensure an adequate daily intake of calcium and vitamin D.
AOR Guarantees: that no ingredients not listed on the label have been added to the product. Contains no wheat, gluten, corn, nuts, peanuts, sesame seeds, sulphites, mustard, dairy, soy, eggs, fish, shellfish or any animal byproduct. I will re-review after my next bone density scan and up my rating if there is improvement, but so far, it's much better than the chemical alternatives. AOR is a trusted company. Excellent quality. I have been taking this product for over a year. Can't wait to see any improvement on my bone denstity. I have been using this product for many years with great success. I experienced a large degree of bone density improvement in both spine and hip. I recommend giving this a try for bone building success.